Overnight Chai Eggnog French Toast Casserole loaded with flavor, plus it’s gluten free and dairy free! This french toast casserole is the perfect make ahead breakfast for Christmas morning! Grease a 13×9 pan with cooking spray. Add cubes gluten free bread to baking dish. To a large bowl add, eggs, eggnog, maple syrup, vanilla, cinnamon, cardamon, nutmeg, ginger, clove and salt. Whisk until everything is smooth and combined. Using your hands, gently press bread down so the custard covers each piece of bread. Wrap with tin foil and place in the refrigerator overnight. Remove casserole from the refrigerator. 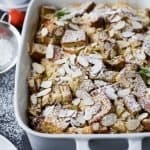 Sprinkle sliced almonds on top of the eggnog french toast casserole. Bake covered for 35 minutes. Remove the foil and bake an additional 10 minutes. Until slightly browned on top.